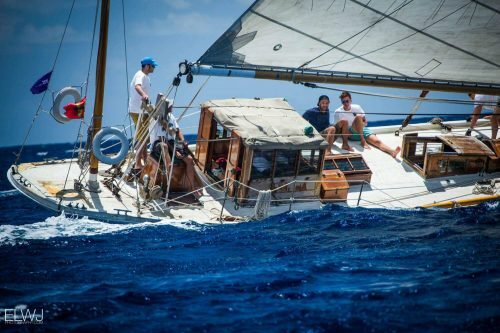 Antigua Classic Yacht Regatta, 2017 – Sampson Boat Co.
Antigua Classics (as it is affectionately known) is, for many of us wooden boat freaks, one of the most looked-forward-to events of the year. The blend of luxury vintage yachts, local working boats, and classic cruising yachts is quite unique. 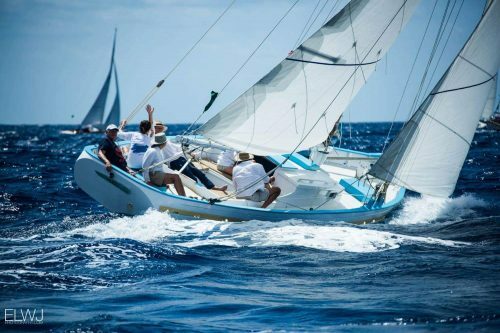 It comes with none of the pomp and nonsense of the Mediterranean classic circuit, and it is loathe to exclude any vessel that wants to take part, but it still has enough class to attract the most beautiful boats in the Caribbean. 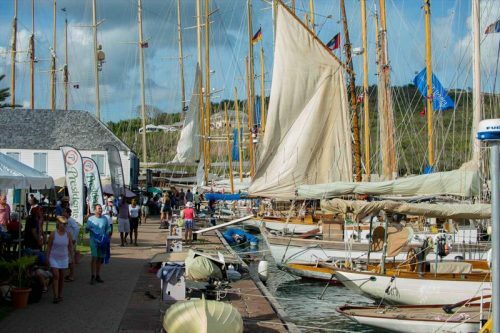 This year’s event, the 30th Anniversary, was to be held in Nelsons Dockyard – the historic and sheltered harbour that was used and developed by the British Navy in the 18th Century. It made a nice change from Falmouth harbour – wandering amongst the vintage sailing boats and the original stone buildings you could almost imagine you were back in the days of pirates and buccaneers, until you approach the throng of sailors crowded around a small café and see that rather than playing cards and tying turks-heads, they are staring into macbooks and iphones, updating statuses and posting selfies. 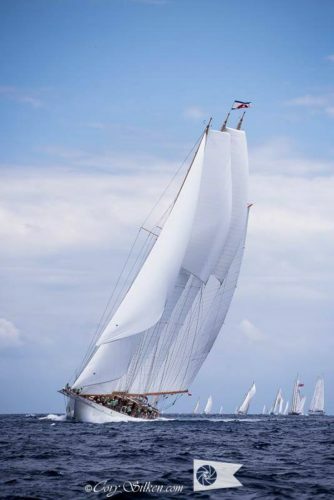 On Adix, we moored stern-to the old wall, and prepared for the regatta – moving half-ton sails around, splicing sheets and tack-lines, whipping tops’l halyards and fisherman barber-haulers, leathering chafe and lubricating tracks. In the evenings, I swam at Galleon beach, or ran around the headland under Shirley’s Heights, exploring the Mermaid Pools and scaling the cliffs above them. With some good music in my headphones I am content to wander through the countryside for hours, but the sun sets early in Antigua, so like it or not, I was forced to resort to drinking and making a fool of myself in the bars. 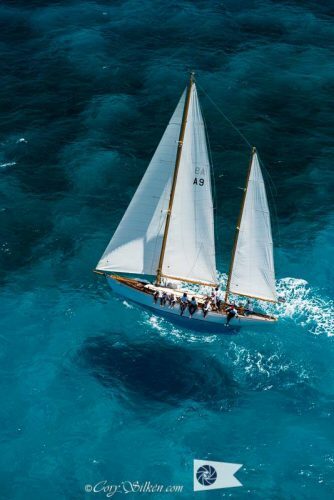 Luckily, as the Regatta drew nearer, I was able to make a fool of myself in good company – many familiar boats arrived, bringing thirsty friends with stories to tell. Columbia and Mariette moored nearby, as did Wild Horses, The Blue Peter, Juno, Saphaedra, Vagabundo II, and many more. And then of course, there were lots of friends who arrived without a boat, and could be relied on to be at the bar all day as well as all night. My mission was to put together a race crew of 30 people for Adix, which is always a challenge because we don’t pay our race crew – and although lots of people are keen to sail such an impressive boat, the skilled sailors are usually employed already. 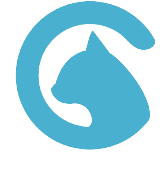 However, we always manage in the end, and this year we had some very experienced hands join us. The next struggle, as the racing begins, is to make sure everybody has the right job for their skill level, and to divide the boat up into different teams to make the crew more manageable. 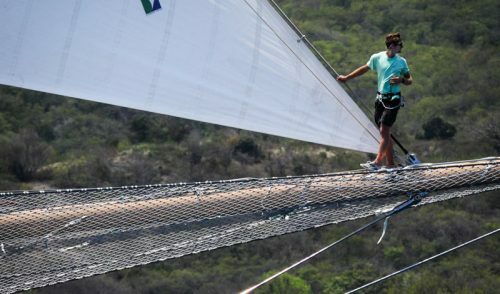 I was on the bowsprit for some of the racing, and spent the rest of the time running around the deck trying to keep an eye on everything at once. 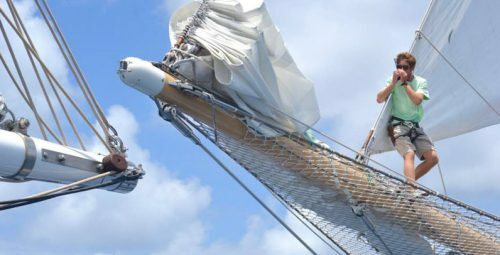 While we are racing the Captain and Mate stay aft of the Charthouse, which is nice in some ways, but it means that if anything goes wrong with any of our sail changes or manoeuvres, as the Bosun I end up being responsible. 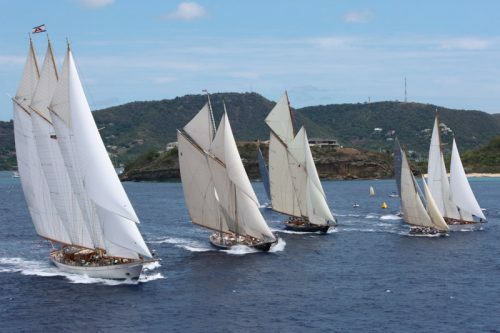 There were four days of racing, with four different courses in the same area just outside English Harbour, in the unsheltered Atlantic wind and swell. The conditions were good for us, being moderate wind in the first couple of days, building as the event progressed. However, the wind was a little strong for some of the smaller boats, and there were a few small accidents – one small sloop broke their mast during the single-handed race, and the schooner Mary Rose managed to push their mast right through their mast step on the practice day. Admirably, they got it fixed pretty quickly and were able to race the last couple of days of the event. 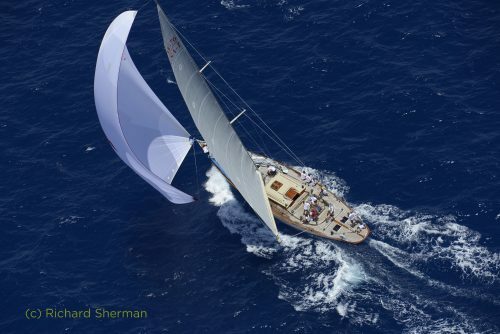 The fleet looked fantastic on the course, and everybody raced competitively but respectfully – There are very few luffing matches or protests, and on Adix we always try to pass other boats to leeward if possible, because our huge mass of canvas makes such a huge wind shadow. This courtesy extends from the racecourse into the restaurants and bars after the racing, and I have never seem much animosity between crews – rather, they keep buying rounds of drinks, in the hope that the other crew will be too hung over to race competently the next day. 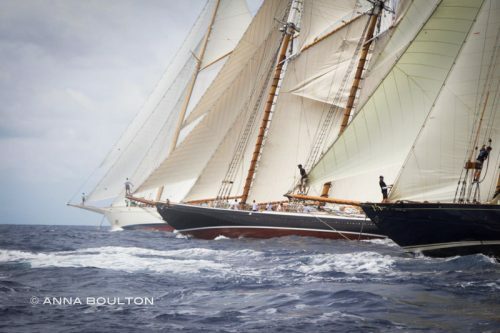 One of the highlights for me was to see the 1911 yawl Anne Marie racing around the course. She has been lying neglected for many years in Canada, but was recently bought by a chap called Simon who has done the bare essentials to get her floating, and is sailing her back home to Cornwall to restore her. Portions of toe-rail are hanging off, the paint is peeling- she is a mess, to be short – but you can tell by her lines that she is a very beautiful boat underneath, and she has a fine pedigree. 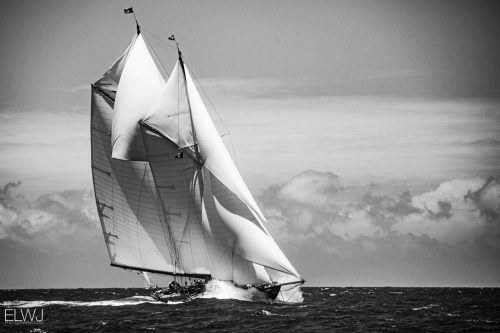 To race her every day in such a state was a fine statement that embodied the spirit of an inclusive regatta. 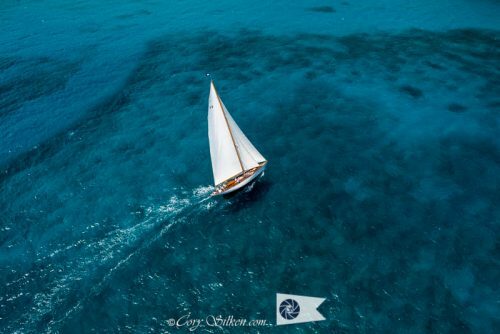 On Adix we shared our start with Mariette and Columbia, two wonderful traditional schooners, and it was always exciting to be so close to them on the line. On the last day there was a muddle in the pre-start and we got a little too close – our bowsprit came within a foot of the end of Columbia’s main boom. I had the privilege of being stood on the sprit at the time, yelling into my radio and terrified for my life, but there was nothing I could do to change the situation, and luckily the two boats gracefully glided away from each other with no harm done. Anyway, the regatta went well for us, and we picked up first place in our class every day. I missed the awards ceremony because I was on watch (the watch-rota-writer and I are not friends), but I’m sure it was great (hint of bitterness?) and I managed to get off the boat a little later to join in when the real party got started. Some of the best reading I have done in a long time! Love your writing style … and the photos are superb! Looking forward to reading more of it!